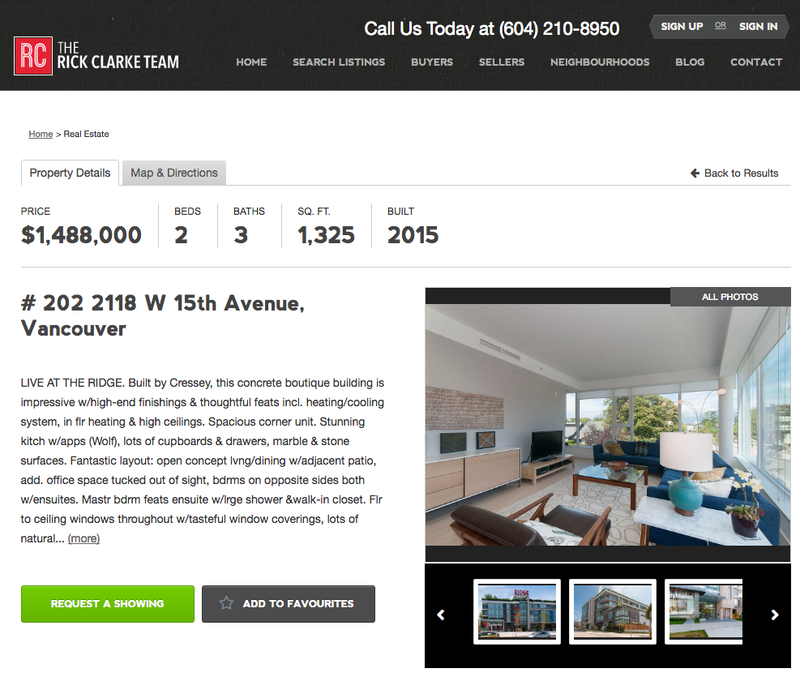 Price, address, and property details in the headline (yes, 1,300 sq ft 2 bedrooms are 1.5 million in Vancouver. Welcome to my life). 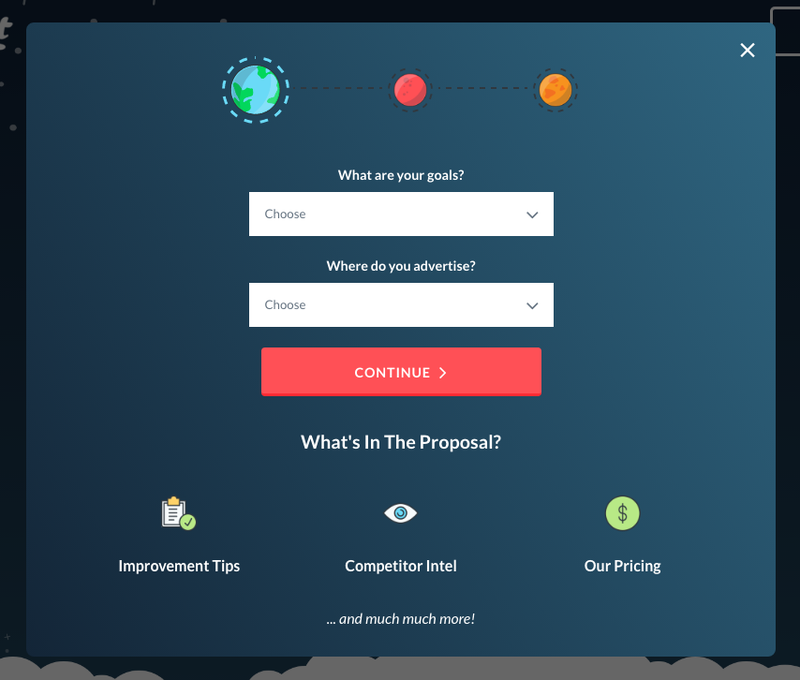 This is an above-the-fold landing page featuring a lot of the best practices. It’s personalized from the Rich Dad coach himself and the copy is a quote from him specifically. 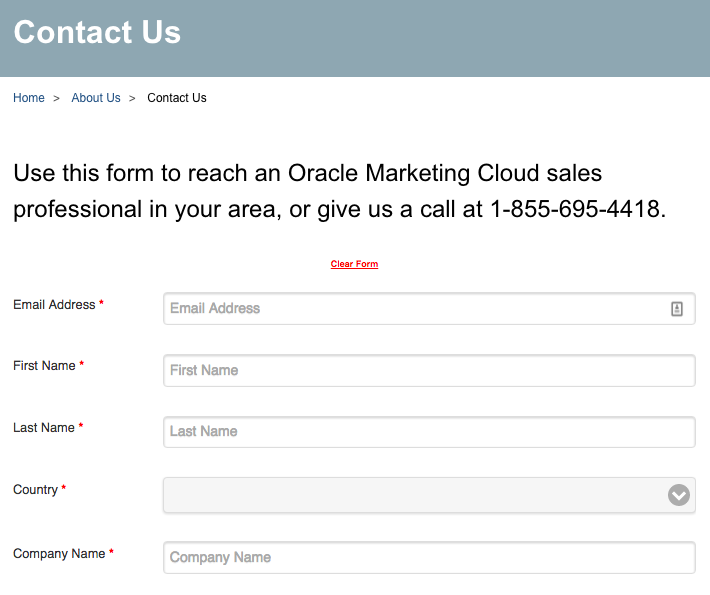 The form is optimized, though I imagine the phone number isn’t helping conversion all that much. What’s interesting here is that it’s a standard subscription LP with the additional “special offer” which I like. Whenever encouraging your sales leads to subscribe, be sure they understand the value. Normally that’d just be “get weekly content” or “exclusive access to new content.” But an additional special offer is even better, as subscribers get everything they were expecting plus something more. Online Trading Academy uses multiple CTAs well, and this is a solid best practice which every business needs to keep in mind. 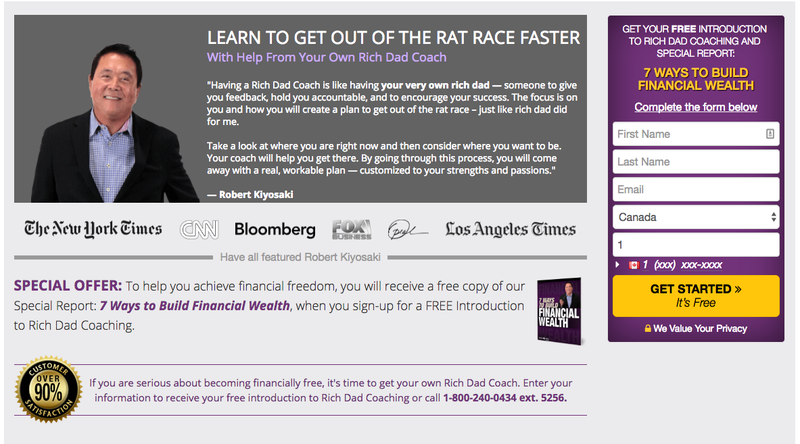 The landing page itself also follows best practices, but I chose it because of the bottom CTA particularly. 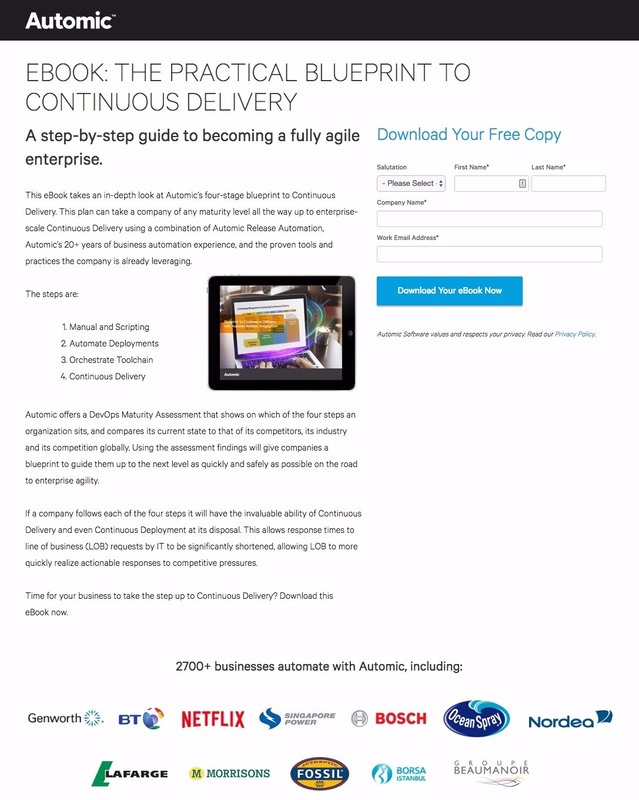 Whenever you have a landing page which is more than a single above-the-fold section (meaning it requires scrolling to see its entirety), you should have a second CTA button at the bottom of the page. It might seem ridiculous, as (surely) the visitors can just scroll slightly up. But any strategy to make conversion easier should 100% be tested. I like the strategy here for the academic industry of “Request a Syllabus.” Like “Request Quote” or “Request more Information” in other markets, “Request Syllabus” is one of those half conversions which get lead information, but don’t feel (to the new lead) like they’ve committed. In longer sales funnels, half conversions like this are a great way to capture lead information and start a conversation. More bullet-pointed value propositions at the bottom for people not quite sold. A prominent phone number making an “Educational Advisor” accessible. RedAcademy has a couple offices, and for each one they have a location-specific website. The headlines change, the courses change (of course) and the images on each page change. 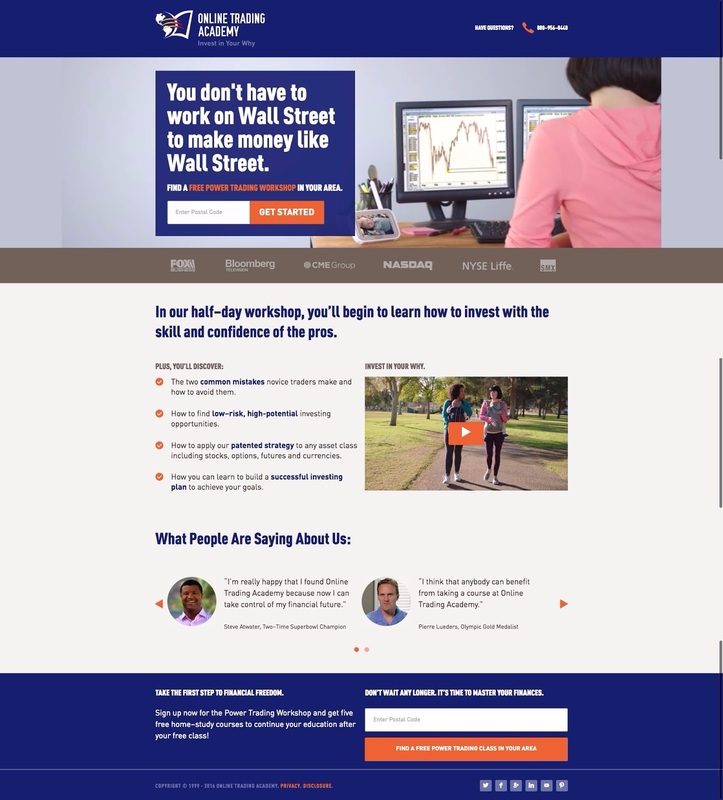 Their messaging is the same – as the courses are the same – but the personalization appeals. The website recognizes (from your IP address) where you’re located and then goes from there. 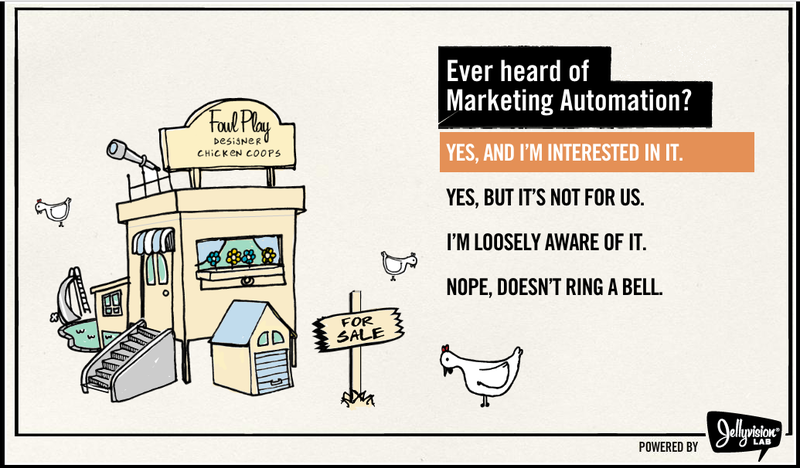 This sales lead generation strategy stands out for me simply because it’s done so beautifully. It’s nothing fancy, really – simply a VIP demo request. But everything is visually optimized to the Nth degree. The icons are colorful and friendly. 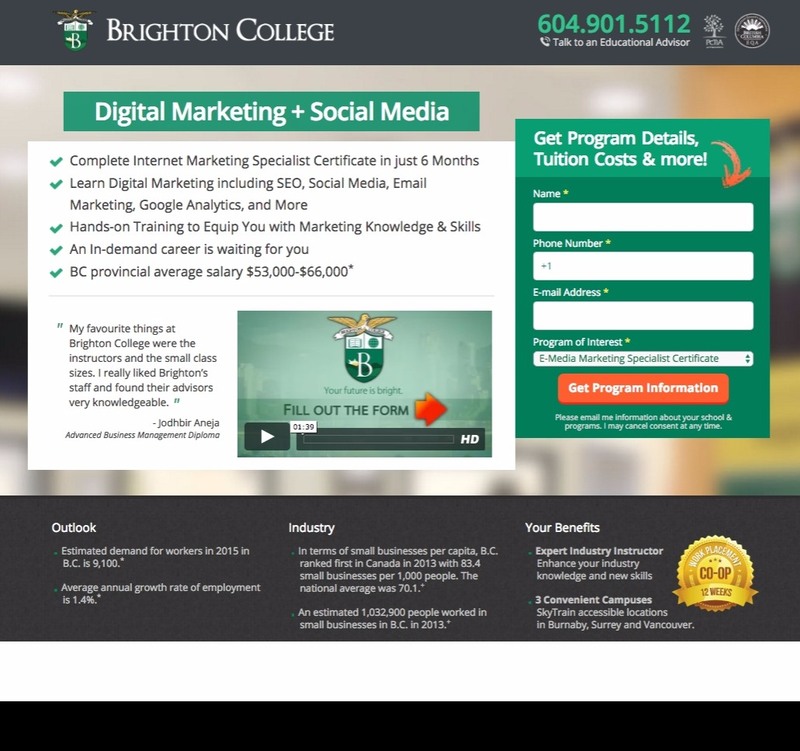 The CTA button stands out like a lantern and the click popup will get a higher conversion than any landing page would. First and foremost it’s a very valuable lead magnet, but many businesses have that. 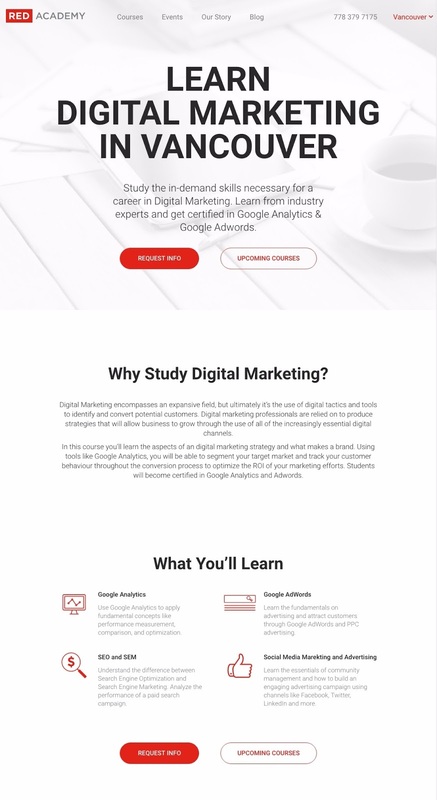 What I like about this landing page is the “750+ businesses automate with Automic” section at the bottom there where they feature some big-name brands. This strategy drives trust with prospective clients who may not know much about your company. If they recognize people who have worked with you and trusted you, they’re more likely to do the same. 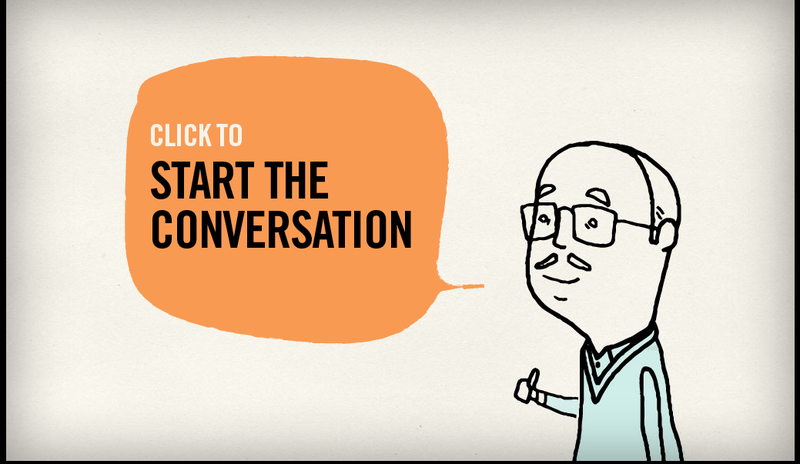 Oracle’s interactive video is ahead of the curve. They’ve created an explainer/product demo which changes based on the viewer’s answers to multiple choice questions. It’s professional but fun, hand-drawn but clean and has a great pace. 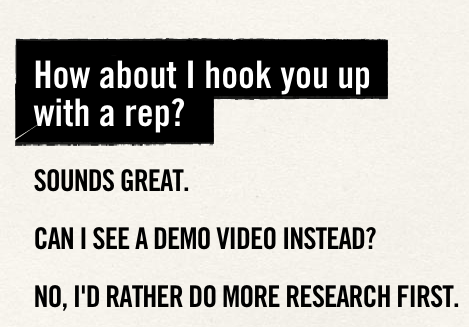 And, at the end of the awesome educational video (in which you’ve learned everything about marketing automation and also their unique selling point), they have another multiple-question which asks “How about I hook you up with a rep?” and, if you say yes, sends you to the lead gen form. Any business who can do anything like this is a winner in my books and in the books of discerning leads. It’s the perfect combination of education and sales. 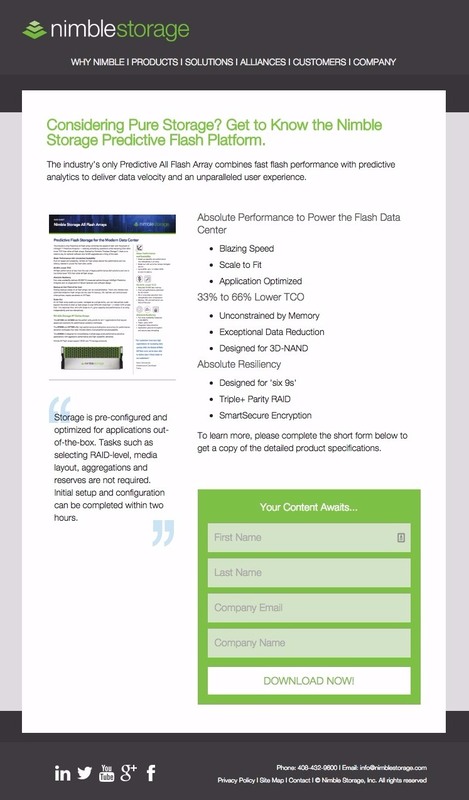 Nimble Storage’s whitepaper on product specifications is, clearly, only interesting to their very specific niche market. Choosing to email-gate it is, initially, a bit of a surprise. But then you have to consider that anyone downloading this ebook is shopping around for businesses who address their specific pain point. That’s someone Nimble wants lead information from. And, in turn, they’re not going to hesitate to convert to get full product specifications in one place (a downloadable PDF). 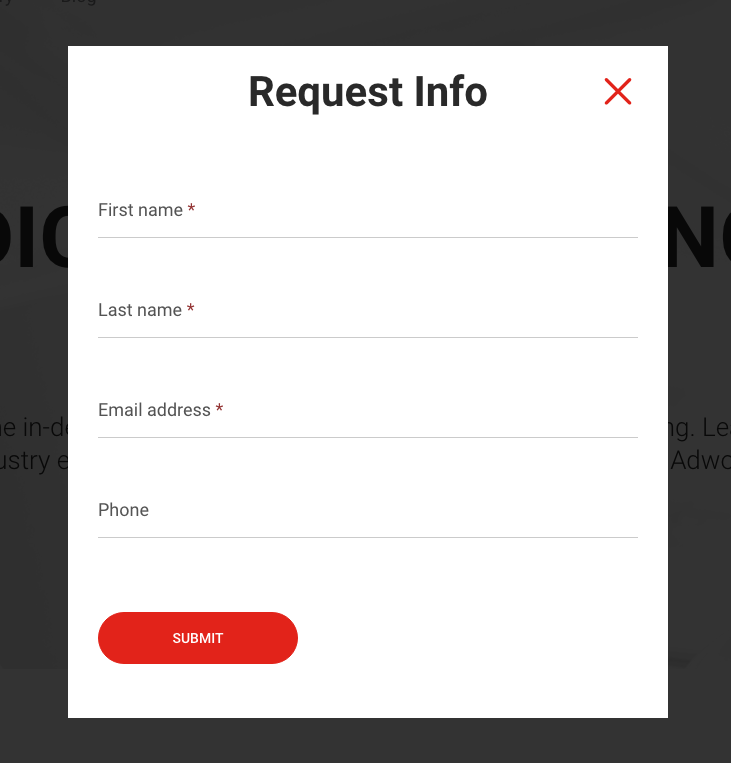 I also like that the lead form asks for Company Name – indicating that there’s some lead qualification and segmentation going on, which is always good before sending leads into a nurturing stream or sales interaction. Whenever a 3rd party business or organization recommends you, your brand needs to be on top of it. Tools like Mention and Google Alerts can help with that, but ultimately it’s about being vigilant. 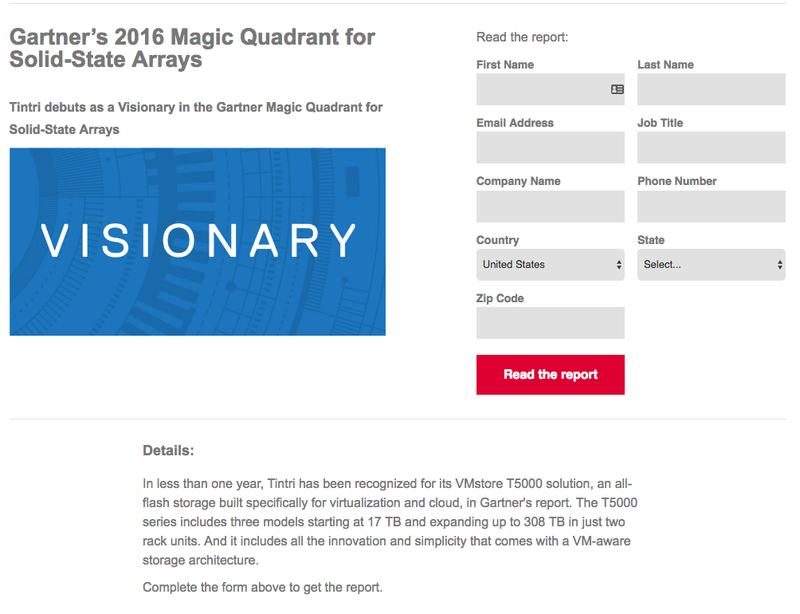 Tintri is mentioned in a report from Gartner and they immediately got in touch (or had a pre-existing relationship) with a request to use the report for their own lead generation strategy. This is a great way to not just generate leads, but show how your business is being objectively judged as superior by an unbiased 3rd party. Free tools are a great way to provide value to your prospective customers even before they subscribe or become a lead. A mortgage calculator and “Get Pre Approved” CTA are a great combo. 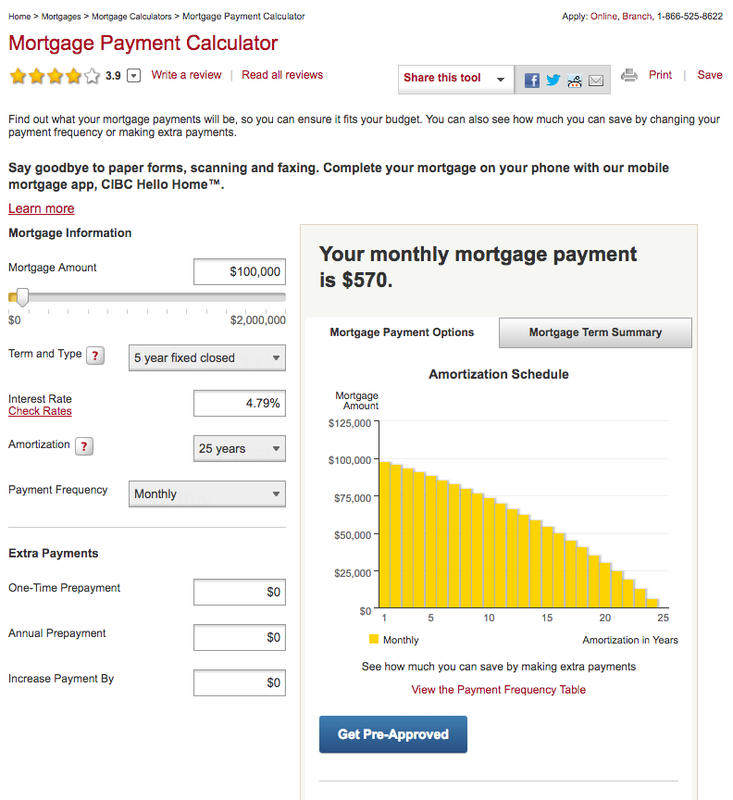 You see what your mortgage might look like based on the information you put into the fields and then, right there, there’s a CTA to get approved for what you’re seeing with CIBC bank’s calculator. 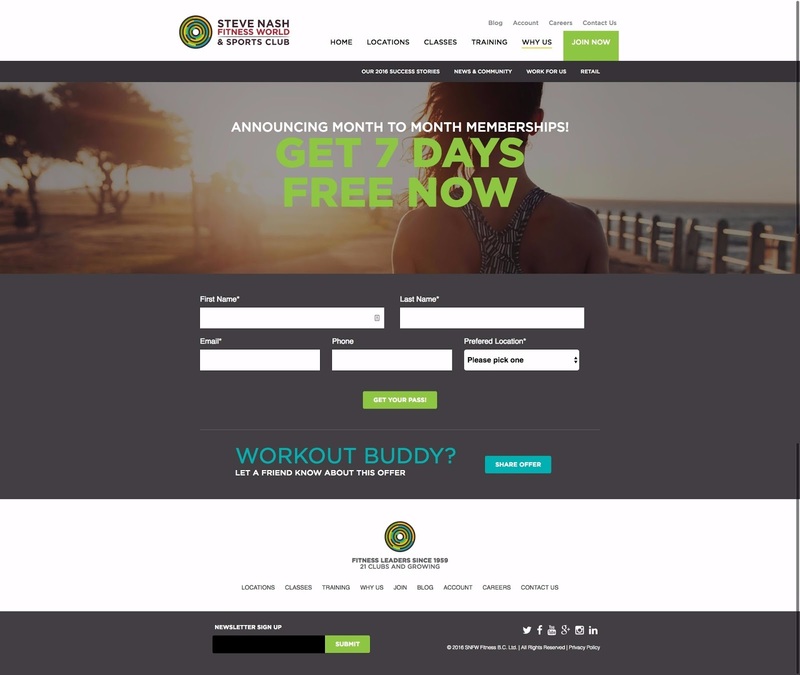 What I like most about this lead generation strategy is, actually, the “workout buddy” share CTA. Making a gym promotion easy to share isn’t just best practice, it’s a necessity. People love to go to the gym with friends – it’s a social thing as well as for health. Think about it. How many times have you heard friends talking about getting back into the going to the gym, and needing a bit of a promotion to give them the extra push? And then your gym makes it easy to post “Hey! here’s the promotion I mentioned the other day + <link>. Would you want to start going back to the gym?” in a Facebook message. These 75 sales lead generation strategies, ideas and examples will hopefully give you all the inspiration you need to turn your website visitors and early-stage leads into qualified, interested contacts ready to talk.